The hand winding, or ‘manual’, watch is the original type of wrist-worn time piece. Although for some the merits of automatic winding of mechanical watches is a necessity, for many the traditional simplicity of a hand wound vintage watch is still an attractive and interesting part of the collection. Although movement details and specifications can be found in the Movement Table, I thought it might be helpful to summarise the hand winders produced by Citizen here as a quick reference point. The summary starts with the earliest model launched in 1931, and ends in 1970. It’s as comprehensive as I can make it at the moment, but if you spot any errors or omissions please let me know. Where I’ve not got verified information on data I use ‘?’ to signify a gap or uncertainty. The majority of models are men’s watches – I have included women’s models where I have been able to find information, and these are indicated in the name / movement type column. For more information on dial markings, particularly on the earlier models, please refer to the Movement Table (via the Blogroll link). I have a handwind date/alarm with a serial 63-7033, the date identification is 90711911. Can you give me further information on this watch. It needs the ‘cover’ for the link to the lugs. These alarms were Citizen’s second version of their alarm model, both of which I believe used what was originally a Swiss design. The same design has since been used, until quite recently, by the (Russian) Poljot make. The first models used the 980/981 caliber and came with 17, 19 or 21 variants and were produced from 1958 to about 1967. They differed from yours in that they had a ‘cricket’ style case, i.e. they had an inner and outer case back, and had no date window. Some of the early models also used a central disk to set the alarm rather than a fourth hand, and these are very hard to find. The later models, as in your example, were first produced in 1964, and were probably made up to the mid 1970’s. These use the 3100/3102 version of the same base movement and had a date version, all with 21 jewels. There were a number of models made, some depth rated, and they also made a couple of ‘V2’ models later in the production run which had black cases and more colourful dials and alarm rings in keeping with 1970’s design trends. The movement is a hand winder of course, and is a pretty straightforward mechanism, with a separate winding spring for the alarm which is sounded via a small hammer – this vibrates agains a pin set into the case back. This means that the case back has to be fitted in a specific way, but there is a locating pin on the case to help do that correctly. Hope this is useful – if the model I’ve shown is not the right one, please let me know! Hi Rick, nice to hear you have one of the Poljot alarms. I avoid giving valuations since there are many variables and the blog is really about sharing information to help collectors and owners. And in your case I don’t know enough about Poljot values anyway! You could try the Russian watches section of the WathUSeek Forum: http://forums.watchuseek.com/f10/ (obviously you’d have to register to post there). Also if you’ve not done so already, you could try searching for recently completed sales of your model on the internet, that can give a real idea of market value. 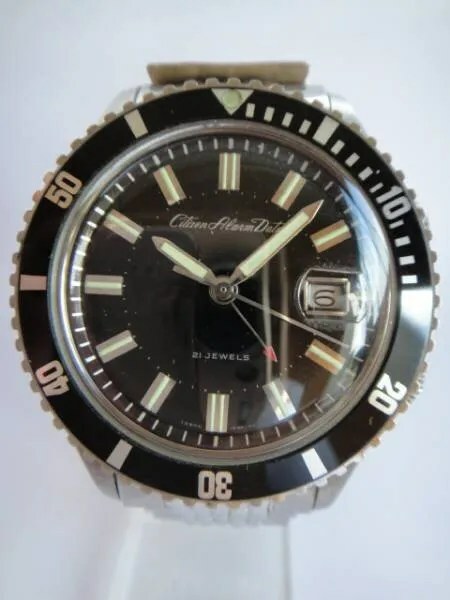 hi sir, i need to know about citizen alarm date diver 1971 (?).. i need to know about the movement and any information around it..
a lot of my reply to Steve Hopkins (see above) will apply to your watch, which will be one of the second versions of Citizen’s alarm watch, using the 3100 movement. These were made from 1964 to around the middle of the 1970’s. They all had 21 jewels, beating at 18,000 beats per hour. The original movement was a Swiss design. The year is shown by the first three numbers in the serial number (on mine it’s 10831057), and since we know these watches were only produced in the late 1960’s to mid 1970’s, the year of production is 1971. The next two numbers – 08 – give the month of production, i.e. August. As far as I know the rest of the serial number tells us that it was the 31,057th of these to be made. I received the Citizen Alarm Date diver watch. I can’t figure out how to post pics here. I was pleasantly surprised to see that it winds smoothly and ticks, and the alarm function works (sounds like a cicada). It is in a large and heavy SS case and is psychically in good shape, though a new crystal will need to be found. It will look good on a black NATO strap. I love it! My grandfather recented passed and left me one of his watches. It is a Citizen 17 Jewels. Also on the face in the bottom halve is written Water Protected / Unbreakable Spring / Shock Proof. On the back it says Citizen 1417 & the number in much smaller font 6090557. If you leave it too long it stops running – and then have to wind it up. So that why I guess it is a handwinder? And hence my post under this category. I am very keen to know more about this watch / history etc. It is the last thing I have of my Grandfather. thanks for your question about your late grandfather’s watch. First of all, it is definitely a hand winder, and uses the ‘Homer’ 0200 movement, which was first produced in 1960. I presume it has no date ‘window’ – I’ve not seen one with this type of dial markings that has had a date window. I would think these watches were produced in the 1960’s and into the early 1970’s, probably for export rather than for the Japanese market. The serial number on the back – 6090557 – indicates it was made in September 1966, or it could even be 1976. I would think it’s more likely to be from the 1960’s though. The other number – 1417 – is probably the model number. I hope this is of use and interest to you – it is good to have a memento of your grandfather and I can understand that you want ot know more about it. The only difference is that the face is more of a light champaign colour. I can not see for sure from your picture if teh glass cover on the face is the same but teh glass my granddad’s watch is very curved – much more than modern watches – it stands out almost 5mm. You’re welcome Jay, and I’m pleased the information is of some use. The glass on many vintage watches can stand out a lot from the case, it does mean you have to be careful not to knock them and end up with a chip or crack. I believe that your web is awesome. I am new in collecting citizen wrist watch and I somehow stuck to gather information and production detail about citizen wrist watch. I got all things to know about Seiko easily but the reality goes inverted when I face citizen wrist watch. The watch is now in shipment. I will have received the watch in the next two days. I hope the watch is in its original parts at all – The seller said it so. I am very keen to know more about this very first citizen I have. Thanks for the information you’d provide. Hi Agung, thanks for your comments, much appreciated. Like you I found that information on vintage Seiko watches was fairly easy to find, but it was the opposite for Citizens – so I decided to try and fill the gaps a bit myself! Your Newmaster looks to be in nice condition – I’ve seen a few with this kind of dial and they are often in not very good condition. Yours is one of the later versions of the Newmaster, probably from the mid to late 1970’s or even early 1980’s. 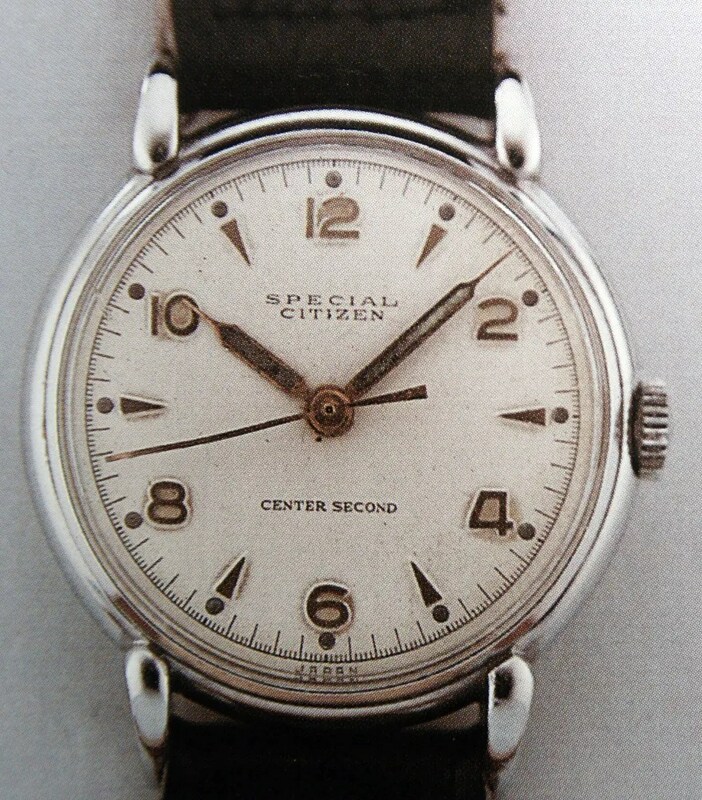 Citizen used the Newmaster name in the early 1960’s as well, when it had the ‘Homer’ 020 movement in it. 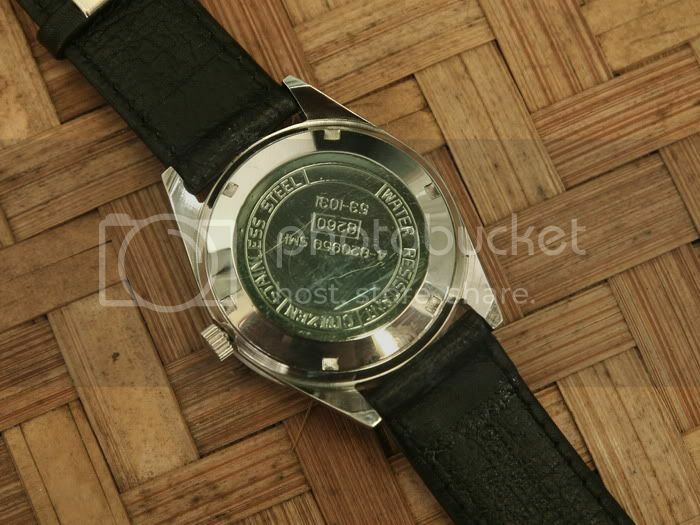 Looking at the back on yours, it should have the 8260 movement in it as per the stamp on the back – this is the hand wind version of the 8200 automatic which became Citizen’s standard auto for 30 years. The other numbers are the model number – 53-1031 – and the case number – 4-820959 (hope I’ve read them properly!) It doesn’t have a serial number so we can’t say exactly when it was made. Might be worth checking the inside of the case back when you get it to see if it’s got a serial number inside. I just bought my first vintage watch citizen new master. Seller told me that this watch is from 80. Serial no 63-4026 date 00400737. Is that true? 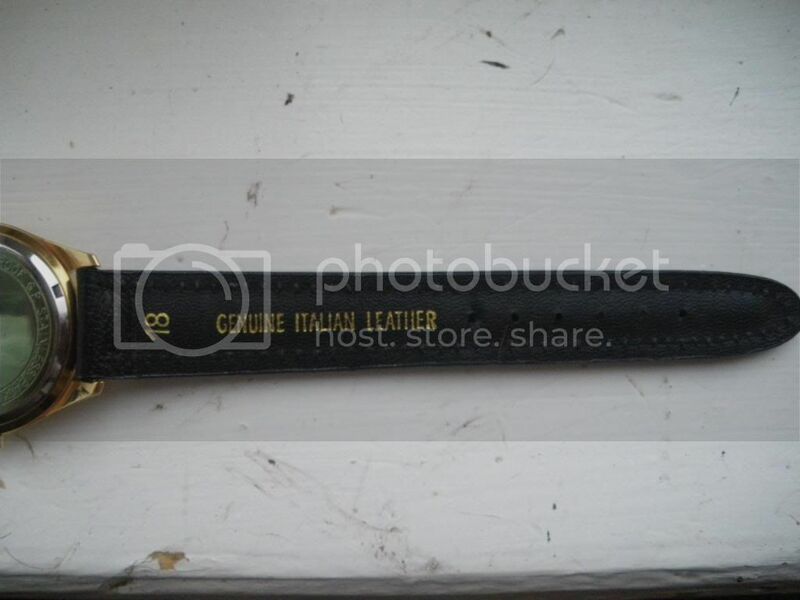 Hi told me this leather strap is original. What you think? Made in Italy and no Citizen marks anywhere. I just start interesting old watches so my knowledge is really poor. 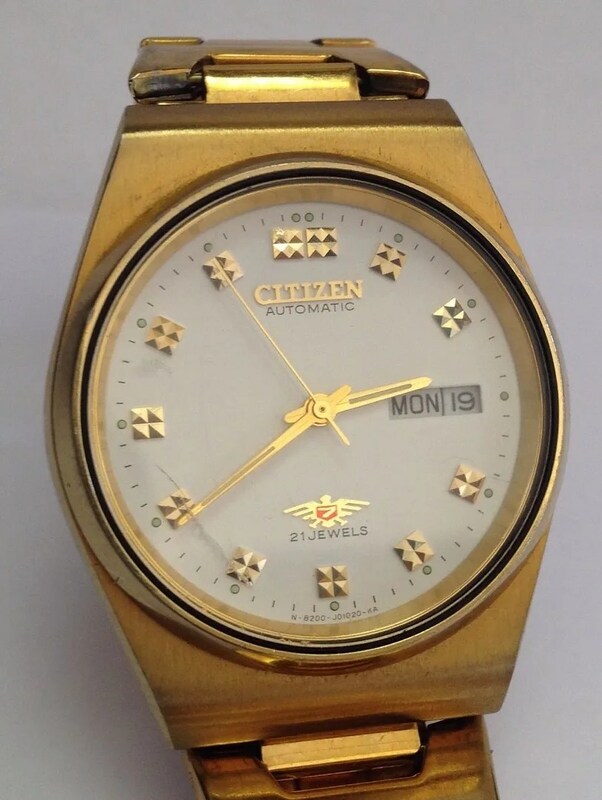 Hi Stefan – good to hear you are getting interested in old watches 🙂 The Newmaster you have bought looks to be in very nice condition, and it might very well be from 1980. It would be helpful to know whether the back is marked ‘water resistant’ or ‘parawater’ or ‘waterproof’. If it’s marked ‘resistant’ then it will be from 1980. If it’s marked ‘parawater’ or ‘proof’ then it will be from 1970 since Citizen stopped using these terms by about 1973. Whoops, The Newmaster one, Ive spent some time trying to find some answers to when this was manufactured and if I can get new ‘glass’ and have it resorted. Now Im a complete Novice when it comes to ‘aging’ these timepieces, But I Think it could be from the early 70’s. Was my grandfathers watch, so keen to get it cleaned up and perhaps ‘Re Golded”! Hi Ade – thanks for the clarification 🙂 I can’t give a part number for the glass, but a decent watch maker should be able to find a good quality modern replacement for it. Cases can be re-plated, but as I understand it they have to be prepared carefully, i.e. de-plated, first so that there is a smooth surface to cover without polishing the case excessively. looks like new and working great . Hi Stefan – good to hear it’s running well. The ‘Homer’ movement in your Newmaster is a very good one and was used by Citizen for many years. Hi Stephen.. I interest about Homer.. Citizen produced some wristsatch using Homer mark on their movement. Do you know the stories behind Homer? It means class positioning or design model? Hi Chemmy, I’ve done a couple of posts on the Homer which might be of use: https://sweep-hand.org/2012/02/23/this-weeks-featured-watch-23-the-homer/ and: https://sweep-hand.org/2012/03/26/this-weeks-featured-watch-28-the-homer-railroad-watch/. I think the ‘Homer’ name was used to mean a reliable watch that wasn’t expensive, but it still had it’s own identity. It was a basic hand winding watch rather than a design model, but the movement was obviously a good one since it was produced for 20 years or so. As we know, Citizen have numeral identity for their movement such as 1802, 3100, 6000, 5400, 6501, 7200, 8200 etc.. Some of them had Homer mark also.. Yes, maybe at that time, Citizen didn’t have clear model hierarchy.. Event they have movement numeral hierarchy, Citizen still put Homer mark on their movement..
Nice to share.. Today in my country is Monday, 8:54.. Good morning, it good to start the day! Hello I just had my late mom’s Citizen watch cleaned. Not sure how to find out more about it. At the back it has the serial no (?) 66-3026 Its a 21 jewel automatic, GP stainless back. Hi Sigrid – 66-3026 is the model number, but this is not too helpful I’m afraid since Citizen’s model numbers don’t always tell us too much about the watch. Are there any other numbers on the back? A case number would be very useful, it will be in this format: 4-xxxxxx. Hi Sigrid, thank you for the extra information and the photo. Although I haven’t got the exact model in my reference data, I do have other ladies watches which have model numbers like yours – 4-330xxx. They appear in the 1971 catalog, and are similar in size to yours, some are marked 21 jewels too, so I’m sure they use the same movement. There are also similar models in marketing material from 1969 & 1971 I have. From the retail prices at the time they are good quality watches. The first three digits of the serial number (9080295)gives us the date when the watch was made, so I reckon yours is from August 1969 – I don’t know if your mum had it from new, but if so does that date make sense? I hope this information is of some help – unfortunately ladies watches are not collected, so there’s very little information around about them. I’m sorry to hear that you have lost your mum, it is nice that you have her watch and that it is looking good after cleaning. My dad gave this watch to my mom when they were young. The date doesnt make any sense though but what I know is that my dad’s mom liked watches and other jewelry stuff. My parents were 17 in 1969 -they were one of those kids who went to Beatles concerts lol. My dad probably got the watch from his mom -oh dear. I hope he told his mom about it. Thank you so much for the information. It means a lot. Hi. I just acquired an old hand wind ‘Special Citizen Center Second’ model which doesn’t exactly fit any of your models listed. I can supply photos. The movement has a low number of jewels, as I can only see two from the back of the movement. It is also only 22.9mm in diameter. The bridge says CITIZEN and by the balance wheel it has the number 36 or possibly 56. The dial has an inner track for the second hand and the hour hand falls inside that track while the minute hand goes all the way out to the Arabic numbers. It is gold plated with fancy lugs, all 12 numbers in gold with gold hands and bright blue second hand. The back is stainless steel and reads ‘CENTER SECOND |STAR| EVERBRIGHT BACK’. Hi Steve, congrats on your acquisition. Yours sounds like it is one of the ‘Special Citizen’ models first produced in 1950 – see the sixth row in the above table. They had 8, 11, 16 or 17 jewels so you may have one with a lower jewel count. As a relatively early model, the movement wasn’t given a name or number and was probably only in production for a short while before being superseded by the 1952 centre second models. The width of the movement given in my references is 23.30mm. The case back on yours is marked in the typical way for that model. I’m not sure what the ’36’ or ’56’ is – some have the jewel count stamped on the movement and some have ‘3ADJ’ (i.e. three adjustments). It would be great to see a pic or two, especially of the movement to check that it is the 1950 version – you aren’t able to post an image directly here, but you can post a link if you have them uploaded somewhere. If not let me know and I can e-mail you and I can post them here if you send them to me, if you wish. Nice to see one of these, not so many of the 1950s models appear. I have a Citizen 21 jewels that I bought with my first paycheque in 1968. The serial number is 90702564 model number 63-1232. The crystal is damaged and one of the stainless bracelet links is non-original. Could you direct me where to get it restored? Also, I want to buy a Walter Wolf F1 watch. Do you know where would be the best place to look? Ebay? 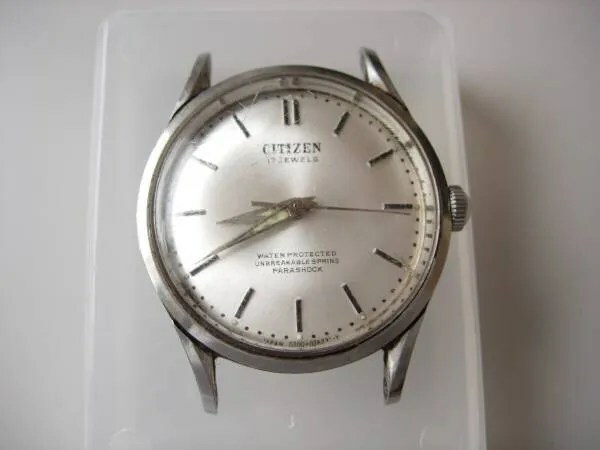 Hi Al, thanks for visiting my blog – good to hear from someone who has owned a Citizen watch from new 🙂 The serial number on yours indicates production in July 1969, so could that be the year you bought it do you think? Sounds like yours has a ‘Homer’ hand winding movement in it – the 02 version if it is a plain dial, or the 18 version if it has a date window. Parts are generally not so easy to find for vintage Citizens, however if parts are required a ‘donor’ Homer movement will be relatively easily available since they have been produced in great numbers over the years. Assuming it is a standard round shape, it should be possible for a watchmaker to replace it with a new one without too much difficulty – I suspect finding an appropriate link for the bracelet will be more of a challenge though. Again finding a donor watch with original bracelet might be the answer. Have you any photos of the watch? Would be good to see it, if you can post a link that would be great (I’m afraid you can’t post a pic directly, only I am allowed to do that on the blog). Although I can’t recommend a restorer, a good local watchmaker should be able to service yours and replace the crystal. As to the Walter Wolf chronograph, it is a rare piece. I think I’ve seen two for sale on eBay over last couple of years – just got outbid on one of them in fact! I have seen a few more on Yahoo Japan, but buying from there is a bit more complicated since non-Japanese buyers need to go through a third party service to place bids and ship the item – this adds a fair bit to the cost. Let me know if you want more info on this and I can e-mail you. Hi Stephen, You would be correct with the date…I graduated from school in 1968 and bought the watch very shortly thereafter….long time ago….. The movement is the 18 vesion with the date window. The movement is perfect, just the link on the bracelet is non standard (i had it torn off my arm in a motorcycle racing accident) and e crystal is scratched. I will look for a donor watch for parts. Sadly I have been unable to find a local decent watch repairer to do the work. THe watch has great sentimental value to me of course. I will post a pic as soon as I can. Stephen, I forgot to mention that I have a school teacher friend in Japan who would be more than willing to help us if we find a couple of WW watches……. I recently came across a citizen watch with the cursive font that was used for citizen in the HMT-citizen watch that you have posted in the picture above.Below the citizen logo is written 17 jewels.The bottom of the dial (above the 6 o clock position) mentions water protected/unbreakable spring/shockproof.But there’s no mention of Japan/Japan movement anywhere on the dial. Did citizen ever make such watches? P.S.I was surprised especially with the cursive font for citizen until I came accross the HMT-citizen pic posted by you. Hi Pratik, thanks for visiting my blog. 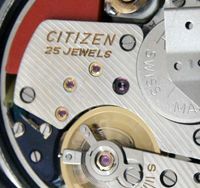 The font is unusual on the HMT watch but Citizen used quite a variety of fonts especially in the 1950s and 1960s so it’s possible it was used on other models. I can’t recall at the moment whether or not I’ve seen that style on any others I’m afraid. 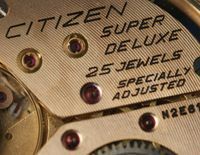 Citizen certainly made watches marked like yours, but usually ‘Japan’ is found at the bottom of the dial. Could the dial have been refurbished do you think? Maybe it was corroded around the edge and has been touched up. If you have uploaded pics you can post a link here (but not any actual images). Thank you for your reply.unfortunately i have no idea if the dial has been refurbished at any point of time.Maybe you’ll be able to comment on it after seeing the pic in the link below. thank you for your insights.I guess the hands must have been changed at some point of time. I’m uploading the pics of the case-back and the movement below.Basically, the watch was lying unused with a friend and I chanced upon it quite by chance.As I said I was drawn to the watch mainly because of the font in which citizen was written on the dial. What surprises me is that most citizen homers either have the “homer” mentioned on the dial or if its an HMT citizen there’d be terms like para shock on the dial..this one seems to be unique. Just the cursive font citizen on a Homer..I’m not sure I’ve seen one before. I guess the case-back isn’t original..or is it?The beauty is it keeps accurate time! Please let me know what you think, I’m posting the links below. Hi Pratik, thanks for the links to your pics of the movement and case back. What you have is a watch that was originally made for export, rather than for sale in Japan. I’ve found that the export models sometimes have less and different dial markings, and this can include what you would normally think is the model name. One example I can think of is some of the Seven Star models sold in Europe. They just had Citizen on the dial and a Seven Star logo above the 6 o’clock marker – ‘Seven Star’ was not printed on the dial at all. Hi Dianne – I’m afraid I’m not able to remove you from e-mail distribution. However, I understand that you can unsubscribe from the blog – there should be a link at the bottonm of the e-mail you get from WordPress to allow you to do that. I am new to all of this. I own a Citizen Alarm Date 21 jewel watch which needs servicing-the alarm goes off when the watch is tapped and it goes off sometimes when I am trying to set it. Where would be a good place to send my watch? I live in Queens N.Y.
Hi Edward, thanks for visiting my blog. Sorry to hear you have a problem with your alarm – I’ll see if any of my contacts on your side of the pond can recommend someone to look at your watch and get back to you as son as I can. Is the watch working itself running ok and keeping time? thanks for your great page and your introduction for “reading” the back of my watch. I try to use it but at the end there is quite a question. The clock hands and the hour marks glow in the dark an it is an hand winder (020-Homer?). It seems that the original glass is not really glass but some kind of plastic? Can it be? I think it must be from Okt. 1961 or 1971 because of the Parawater mark but I´m not sure. Hi Joe – glad to hear that you’ve found the blog page helpful. Your watch is from 1971 since the style of the model number on yours – 63-4018 – was introduced in the late 1960s. ‘Parawater’ was dropped around 1970, but there are examples of it still being used as late as 1973. You are right that it has the hand winding ‘Homer’ 02 movement, which is of course indicated by the case number (4020618). The ‘glass’ in these, as in the majority of similar watches, is indeed plastic and this is correct for this watch. One advantage of this is that it can easily be polished to removed marks and light scratches. Thank you Stephen for your reply. I only have two of this vintage Citizen ones, but I wear them every day and love them. It is nice that others have fun with such “custom” – Citizen watches, too. It is hard to find peoples interested in those japanese “custom” watches. The most vintage watch lovers I know are only fans of the expensive and deluxe brands. Thanks for your help and your great site. I watch it every week. where is my reply from this morning? 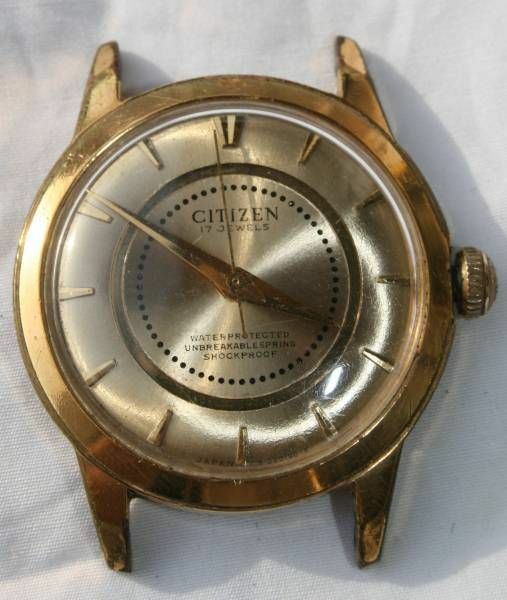 A Citizen Newmaster from 1961 or 1971. Have I made something wrong? Oh sorry… now I see… it is awaiting moderation. Meanwhile I can´t see it. Hi Sweephand, I recently purchased a vintage citizen. I just like the look of it , but wanted to know more. From reading your blog, the watch seems like a later ‘center second’ (6th maybe?). Kind of looks like homer/junior/master. Can’t be master because of jewel count. I just love the look of the watch and any info you could give me would be appreciated. Hi Russ, thanks for visiting my blog 🙂 The watch you’ve bought is a Center Second from 1956 or 1957 – the movement was first made in 1955 (‘Version 3’ in the hand winder table), but yours has shock protection (‘parashock’) which was introduced in April 1956 – the first Japanese watch to have this feature. These Center Seconds were also made with 9, 11 and 15 jewels, but only some of the 17 jewel ones had shock protection. Your parashock version retailed JPY5,460 in 1956/7. I believe these models were made up to 1957, but not after. Note the weights on the balance wheel – these and one 19 jewel 1957 model were the last to have that. thanks a lot. I like your blog. These 50s/60s citizen watches are beautiful. Hi Ajay, thanks for visiting my blog. Your Dad’s watch uses the ‘Homer’ hand winding 1801 movement with date complication. The model number (63-1019) means that it should have ‘Newmaster’ on the dial. Although the movement was first produced in 1962, the Newmasters are from the late 1960s / early 1970s, so your father’s recollection that he bought it in 1972 fits that time frame. The serial number indicates production in August 1969. An interesting issue about your father’s watch and others I have seen, is that these models all seem to have the same serial number. This is odd, but there is nothing to suggest they are not authentic, especially since you father remembers buying it when it was new. Do you know where he bought the watch? hi! I’ve recently bought a citizen watch in an antique shop. I have looked and looked but can not find anything about this particular watch. 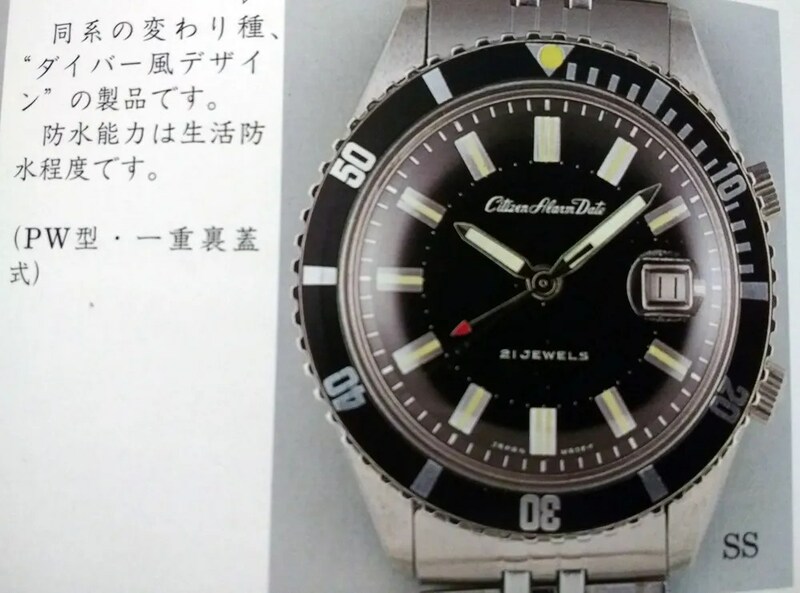 the dial says “citizen 17 jewels”. On the back case is written “Citizen G. P. Stainless steel back 1551 7090441” and the movement says “citizen 17 jewels” and “Japan Japan”. Can you help me found out which model this is? Hi Kris, thanks for visiting my blog. Can I ask if there is another, 2 digit, number before ‘1551’ on the back? Also does it say ‘parawater’, waterproof’ or water resistant’ anywhere? Looking at the dial, is there a number at the bottom (under or to the side of the 6 o’clock marker)? You may need a magnifier to see it. Sorry my reply is all questions, but I’m struggling to identify it without some more info. You were right about something around the 6 o’clock marker, but it wasn’t numbers. it say “japan”. but after cleaning the dial this disappeared. I can’t find any numbers before “1551” but when i was looking with the magnifier i found another number one the back, it says “33676-1361594”. 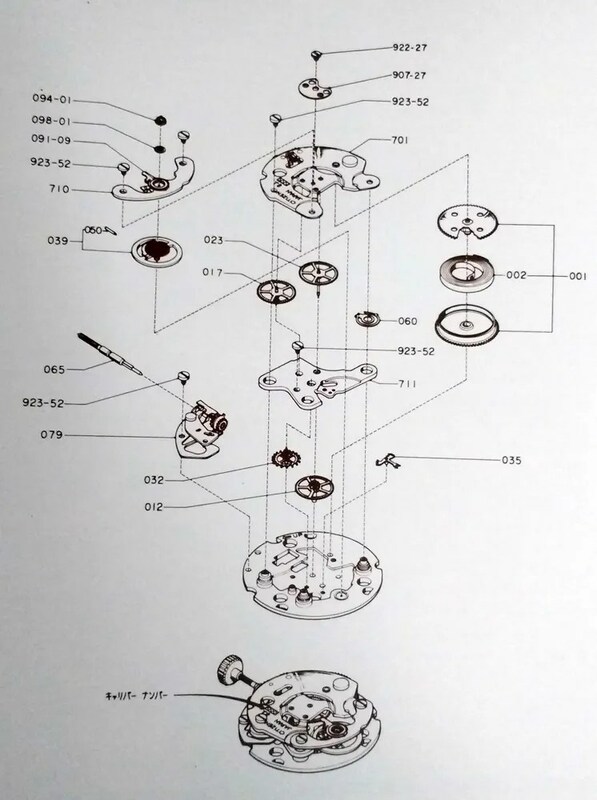 Hi Kris, thanks for the link to the pics – images make things a lot clearer 🙂 Just ‘Japan’ on the dial is not unusual, but sometimes a dial code is also used which can indicate the movement inside. 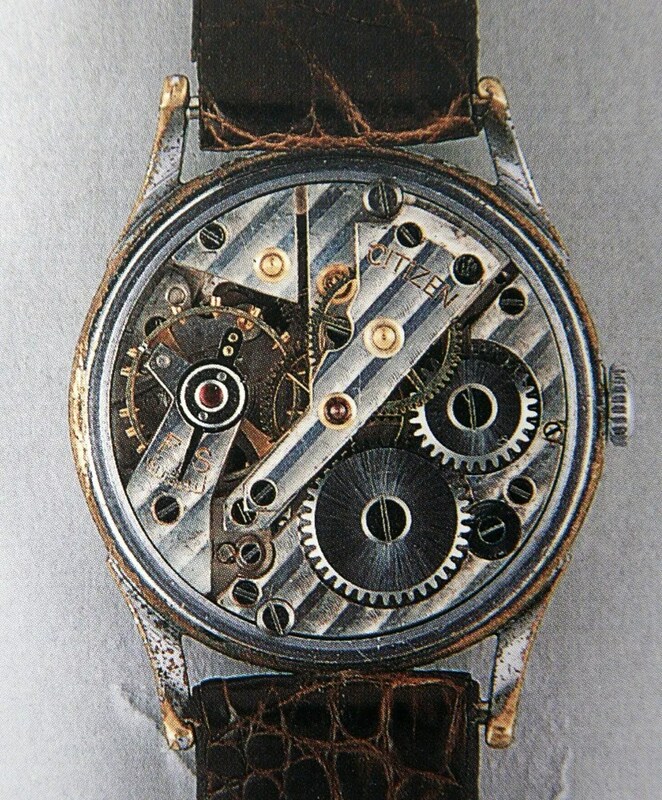 The most helpful shot is of the movement, which shows this has the ‘Homer’ (02, no date) hand winding movement. 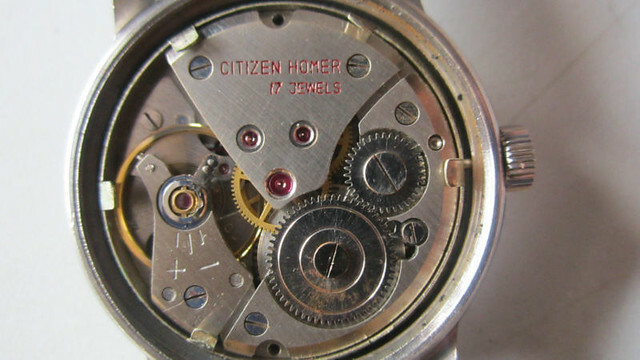 This movement was first made in 1960, and was used in a variety of models, the ‘Homer’ being the most well known. 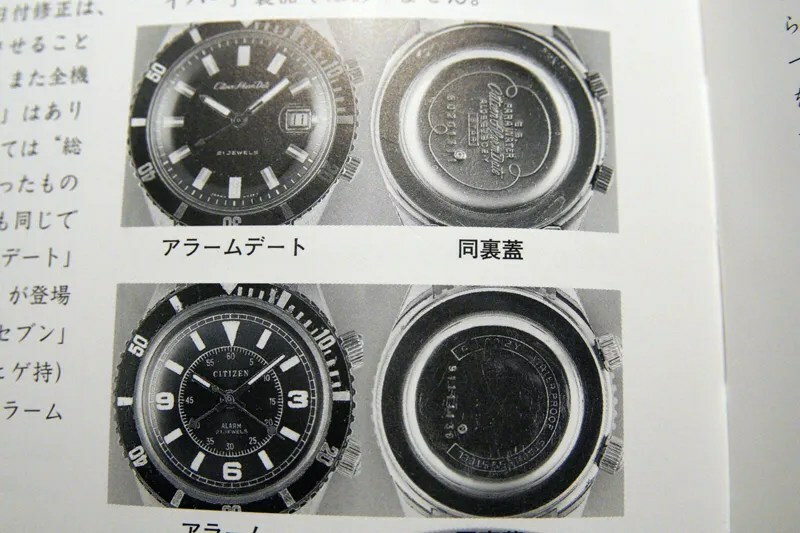 Since your watch is marked ‘waterproof’ it was made before 1972/3 – this marking also indicates that it was made for export, since Japanese market models would be marked ‘parawater’. 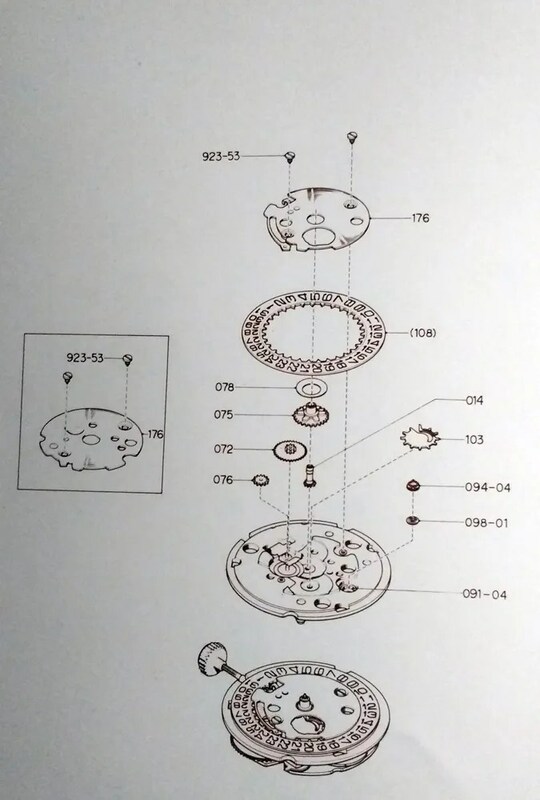 This also explains why the dial has no model name on it. 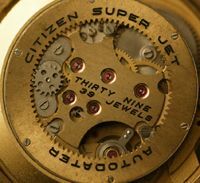 Citizen often simplified the dial markings on their export models. Your watch is quite unusual since it is square in shape, and the ‘1551’ marking, which I would think is the model number, is not in the typical format, i.e. 12-3456. The other numbers you’ve found with the magnifier may be watch maker’s service marks if they seem to be have been engraved by hand. Finally, the first three digits in the serial number (709) indicate the watch was made in September 1967. Hi I have an old Citizen as you can see down. Bu I don’t know its model number and other details.And I can not find how much its price about rare watch. Can you help me? Hi Tanurhan, thanks for visiting my blog, and for posting the links to the photos. The markings on the case back give us information about the watch – the model number is 74-6355, and 4-167678 is the case number. Watches with similar numbers (model number beginning with ’74’ and case numbers with ‘4-16’) have the hand winding 51xx movements, which were first made around 1975. It is a small movement so it was used in women’s watches. If I am reading the serial number correctly this one was made in October 1979. The case material code – ‘CCP’ – indicates that it is chrome plated. You don’t see these watches very often, since they were ‘entry level’ models and most probably would be discarded after a few years rather than serviced / repaired and do have any great value. i also have citizen newmaster 21 jewels, my grandfather give this watch as a gift to my father when my father pass in examination in high school around 1971 when my father 15 years old. who know the price now in year 2015? Thanks for visiting my blog. I avoid trying to give valuations, since there are many things which can affect the value of a watch. You should be able to get an idea of value by searching eBay for the same kind of model. My mom left my daughter her ladies (what I think is) late 70’s or early 80’s watch. 4-680120 is the case number, and helps identify the movement, which is the 67/68. These are hand winding movements that run at 21,600 beats per hour. 0110360 is the serial number, and we can get the year of production from this. However, we need to know which decade it was made in, so it gets a bit tricky. I’ve had a look at some catalogs and noticed that there are 4-68xxxx models in the 1971 catalog, but not any in the 1979 one. So this could mean that yours is from November 1970, which is the earliest possible date (they were not made in 1960). There are no 4-68xxxx models in the 1979 catalog, but there are a few in the 1977 and 1974 ones. Although this doesn’t mean it definitely isn’t from 1980, the 1970 date looks possible. I was just trying to find information about a watch I inhered from my grandma. It seems very similar to the one mentioned above. It’s also CITIZEN 19 JEWELS and the model is 65-4621. The case also starts with 4-68 and the serial number starts with 1. Would that mean it’s from 1971? Mainly, I am trying to find out how it runs (battery?, automatic?). It seems to go sometimes and sometimes not. Thanks in advance for any help you can provide! Hi Katharina – thanks for visiting my blog. Your watch has the same movement described in the above post by Eduardo and my reply to him. 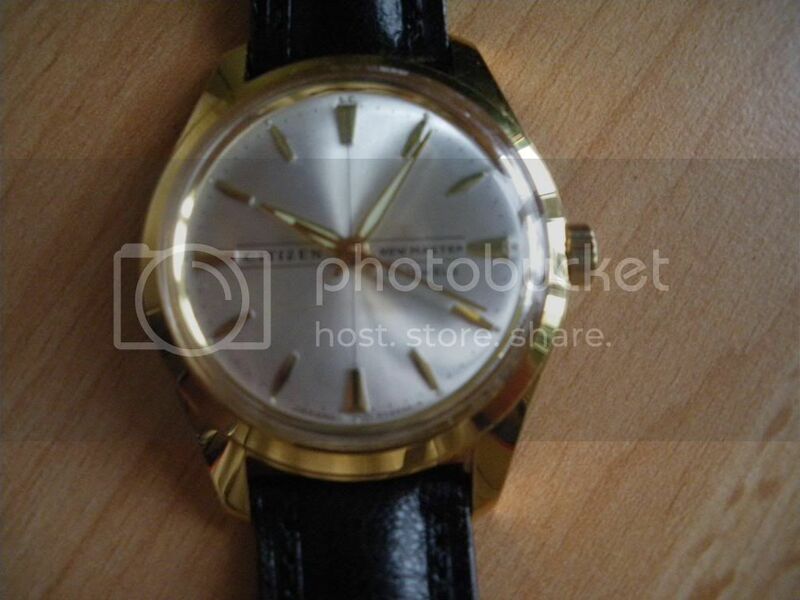 It is a mechanical hand winding women’s watch, so no battery required, and you’re right that it is from 1971. Have you tried winding it? If not gently turn the winder (crown) forward and back – turning clockwise actually does the winding. If it seems to wind smoothly, giving it up to about 40 turns should wind it fully. If this does not get it going, then it will need attention, maybe just a service to clean it and lubricate it with new oil. Thanks so much. It’s actually fine. I just had to wind it. I didn’t know I needed to do that. I never had such a watch before. How often does one have to wind such a watch? Every day? You’re welcome – good to hear it’s running 🙂 Usual routine is to wind every morning – probably won’t need 40 turns though since the power reserve would normally be around 40 hours. So 25 or so turns each day should do it. Can you give me some more information on this watch. Thank you for your information SWEEPHAND…..
It’s a wonderful blog, but I think I’ve been stuck with a bit of a conundrum here. Using your articles as a guide, I’ve found myself thoroughly confused. To start with, the word “waterproof” means it’s before 1970, so the serial number starting with a 9 means it’s most likely 1969/1959. The movement looks like a calibre 1800, but that only went into production in 1962. So that means it’s almost certainly from 1969. In fact, December 1969 if I’m reading it right. But my father says he received it in 1969, his brother in law bought it used from a local pawn shop. I think I’m safe in assuming that it would be impossible for a watch manufactured in December 1969 to have gotten to someone in Malaysia, pawned off, bought by his brother in law and gifted to him in the same year. So long story short, I’m perplexed. The only possible solution I can think of is that my father’s memory is failing him, and he received it later than that. I would be eternally grateful for any and all light that you could throw on this matter. It’s great to see that you have got the watch up and running again for your father, the ‘Homer’ movement is very sound and reliable in good condition so it should be ok for a good few years more. Hi Sweephand, Im Aron from the Philippines, my uncle gave me this Citizen Watch, it surely was from his times, but I don’t know any clue of what kind of Citizen Watch it is, it’s just the watch that he gave me, no boxes, manuals or any papers that would identify it. Wasn’t also able to ask him it’s specifications, too old to remember. Sadly, I don’t raelly know anything about it, and yet Im hooked up with it’s simplicity yet auring class. All i can give you is it’s looks, sadly can’t attached any photos in here, if so ever you have a Facebook Account, please do add me, my name is Aron Castillon, message me so that I can tell it’s you, thank you so much, I hope to have further talks with you! I would really appreciate your help sweephand, this watch really got me hooked, now that I’m into simplicity with class type of watches, and somehow knowing it’s like a Vintage type of watches specially it’s a big brand got me really hooked up in knowing more about it! Hi Aron – thanks for visiting my blog, and for your full description of your uncle’s watch. And you are not ‘clueless’, I can clearly understand what you have posted. You have what is known as an ‘Eagle 7’ automatic watch, which uses the 21 jewel 8200 movement first produced around 1975 or 1976. This movement was used for many years, over 30 in fact, so dating them can be difficult. Citizen introduced the Eagle 7’s (that’s the insignia you see on the dial) in the early 1980s and made them through the 1990s. The 8200 is a reliable one, and can run very accurately and for that reason it became Citizen’s workhorse automatic watch, later being made by their Miyota factory. YP (rather than VP), which stands for ‘Yellow Plate’ meaning it is a gold tone model. 770319 is the serial number, and the first two numbers give us the production date. The second ‘7’ is the month – so it was made in July. The first ‘7’ gives the year, which could mean 1987 or 1997. If your uncle owned if for some time, then 1987 is more likely. I have a weird citizen watch. I cannot find anything on it. On the back it has Mr Japan. 4-022734ka. The front is of hockey it has a hockey player going around the watch. It doesn’t have a second hand. The second hand moves around the outside of the watch. It has a #77 then it says world ice hockey across the middle. Than it says Tokyo at the bottom. The band is blue and says citizen18 all in all it has a weird color symbol. Can anyone tell me anything about this watch. I would really appreciate it. Thanks. Hi Al, thanks for visiting my blog. Although I have never owned a watch like yours, I have seen a few offered for sale on Yahoo Japan that have the logos of hockey teams, and I think American football teams. The design of yours sounds unusual though – it would be good to see some pics 🙂 Unfortunately you can’t post photos here directly, but you can post a link to a hosting site like Photobucket. Or, I can email you and you could send to me for me to upload – just let me know here if you do. The case number on yours – 4-022734 – tells us that there is a ‘Homer’ 02 movement inside. These are solid hand wind movements first made in the early 1960s, and produced right through to the 1980s. I’m not sure when these special models were made, maybe the 1970s – I wondered if it might have been done for the 1977 world ice hockey championship, but that was held in Austria, and there was no Japanese team in it! My email is ……. contact me and i can send you pics of this weird watch. Thanks. Hi Lynette, thanks for visiting my blog. The code ‘2501’ on your watch suggests it a version of the 2500 movement inside. This is a simple hand winding movement that was used in the 1970s, so I reckon yours is from August 1978. I’m afraid it will not have any great value. It is working and with a replacement bracelet or a strap I’m looking forward to wearing it. I’d love any information you might have for two reasons, firstly I’m very interested in learning more and secondly I’d love to prove to my husband that I didn’t waste the money and did in fact get an absolute bargain!! In searching for more information on a watch that I had recently acquired I found this blogpost. The watch is a Newmaster 22 in very good state with original bracelet. It must have been from the end production run because the movement details are printed instead fo stamped on metal. Serial no suggested that the production year was 1982. It keeps accurate time and looks presentable after a good clean and a bit of polish on case and bracelet. Hazel, just an advice, if you are looking for vintage watch if possible go for stainless steel cased instead of those with base metal bezel. Base metal gets pitted and look less attractive over time. There are really two parts to a good watch to consider, the movement inside that runs the watch and the case that house it. These two will determines the general state of a watch and how long it can stand the test of time without much issue. Then again there are many options out there, have fun learning. Snagged another one today, Citizen Homer Date 17j, 1802 movement (1970). Apparently one guy has been hoarding these oldies for some years and now he has been letting go one or two at a time. Today he also brought out a Favre-Leuba Sea Chief in decent condition, would have taken that too have I not oredi own one. These handwinders/manual wind watches are growing on me. They feel so much better on wrist than their equivalent autos. Being where I am, I got it cheap. 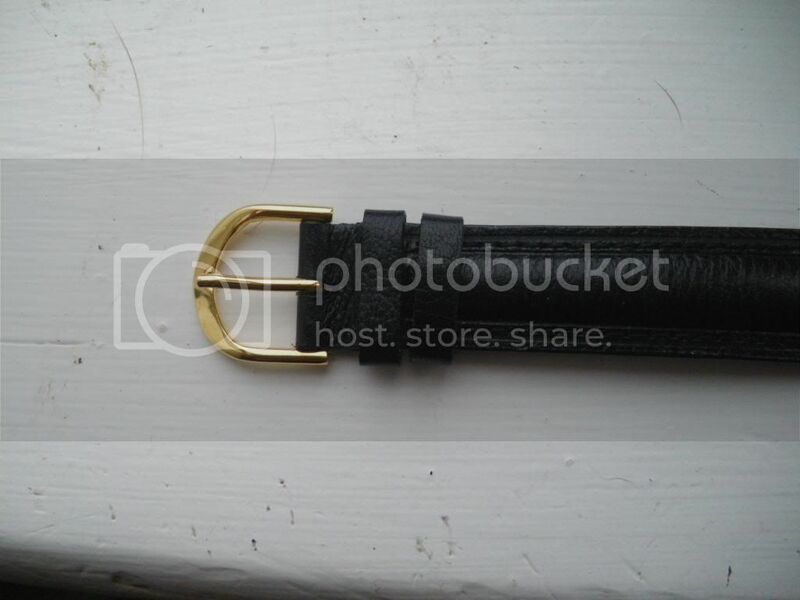 The price asked is not much more than the cost of a decent leather strap that will go on it. Pity there is no original bracelet, nor the crown & crystal original. 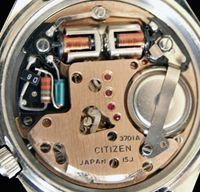 Placing the Citizen next to Seiko Skyliner 6102 of the same vintage (1969) one can perhaps discern that case design and machining on a Citizen looks a little less fine. But then I have only two watches to compare. I am not a watch collector per se, in the near future I know that I will find a new home for these watches. I just feel a little apprehensive just because pretty few around here appreciate these pieces from horological history and give them their due services that they require so that they can keep ticking for some years yet. The pleasure in having these piece of history to me is to actually wear them and let their history lives on. Perhaps their second hands sweeps is not as refine as those on their ‘richer’ cousins with higher beat movements. On second thought, think I quite like the fact that the second hand on this particular Citizen Homer is wider than on its equivalent Seiko Skyliner! I dont have to squint to see it glides around the dial. 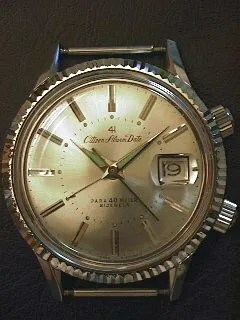 I just found your site after looking at this vintage Citizen watch on Ebay and doing a “citizen vintage watch” google search, hope you dont mind. 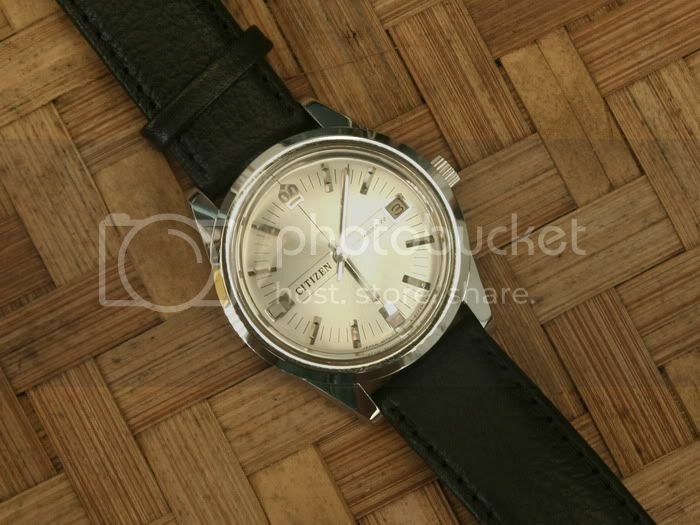 With that said, I really know nothing about vintage watches and would like a bit more information before I make an impulsive decision to buy it (it is a nice looking watch). I hope this is not extra work for you, I am simply a new watch enthusiast trying to learn, so any information you can share is greatly appreciated. Hi Juan, thanks for visiting my site. No problem about asking for advice here – I will do what I can to help. The watch you are looking at, model number 63-1019, should look like this: https://lh4.googleusercontent.com/-jscrShSptaM/TXJiw2uKlfI/AAAAAAAABD8/1WXnMmv4n1o/s400/IMG_0695.JPG It looks like the dial has been re-finished, and incorrectly – no Citizen piece would have ‘incabloc’ on the dial. The case has been heavily polished too by the look of it, and the price is far, far, far too high! This is a watch, and probably a seller, to avoid. I have a 1964 Citizen Homer Weekly HW 141301(Sn 40701446); 17 jewels, para40Mwater and parashock in the dial, bought from a local japanese thrift shop. It is my first hand winder watch. Do you have any idea how to wind properly? I’m afraid of overwinding it. To what winding direction; clockwise or counter clockwise? How do you adjust the date? Thank you in advance! Nice find. Dont see many of those where I am. Winding direction is clockwise. One can feel the resistance increase as full wind is approaching. With power reserve of a little over 40 hours there really is no need to go full wind so that one can wind it at every start of the day. To advance the date one just adjust the hour backward and forward from the hour 8 till the date advance at around 12 hour mark. I have a Homer Date is I wear once in a while and I dont bother about setting the date. I would set it if I am going to wear is for more than a few days! Saya ada satu jam tangan citizen new master 63-1019 jika awak buat tawaran terbaik saya lepaskan pada anda. Saya ada satu jam tangan citizen new master 63-1019 jika awak buat tawaran terbaik saya lepaskan pada anda. Saya nak hantar gambar disini tidak tahu..
Hi, thank you for visiting my blog. Unfortunately Google translation isn’t making too good a job of translating! Is it possible to post in English? Hi, thanks for visiting my blog. Your watch has the 6700 hand winding movement inside, which was made around 1980. They have 21 jewels and run at 21,600 beats per hour. I can’t tell you a great deal more about it, except that it was made in August 1980 (from the first three figures in the serial number). Hi Peter, thanks for visiting my blog, and for your kind comments. Your watch is a hand winding model, with the 02 ‘Homer ‘ movement inside. Although this movement was first produced in 1960 and continued to around 1980, the style of the various markings on your watch indicate production around the end of the 1960s/early 1970s. ‘Parawater’ was dropped by 1973 or so, when ‘water resistant’ had to be used. The first three figures in the serial number – 20600362 – give a production date of June 1972. I wonder if you could please tell me a little about the 2520 movement which Citizen appear to have increasingly moved over to for whatever manual wind watches they were still making during the mid and particularly late 70’s. Although these watches are neither lauded nor well-known, I find them quite pleasing. All the watches I’ve seen the 2520 in are unnamed export models. They seem to perhaps have slightly less in common with regular “named” Citizen watches than did slightly earlier export models I’ve found which used the homer movement. Although it’s rather hard to see its architecture due to the amount of pressed metal covering the non-dial side, the 2520 movement looks and feels totally different from the homer movement and has three crown positions even though the watches I’ve seen it in lack day or date. The crown also doesn’t engage with anything at all when back-wound, which feels a bit odd :). Given all this and its 21600 beat rate, is it sensible to surmise that it might derive from an auto movement? If so, might you be able to suggest which one? If I am jumping to conclusions, are you able to tell me anything more at all about this movement? When I first started researching it a few months ago, I noticed that one or two apparently knowledgeable commentators had taken one look at the amount of pressed metal on display and concluded that this was a pin-lever movement. It isn’t, as an even more knowledgeable German-speaking commentator has pointed out. However, it is very difficult to see what it is! Hi Mike, thanks for your kind comments – much appreciated 🙂 The 2520 and 2510 (with date) calibres were introduced in September 1972 and were made until 1980 or so. Homer (02 / 1810 movements) were also made until about that time. The 25xx movements were designed for easy mass production, with fewer parts than earlier calibres, and were made for the Middle East and Far East markets. Targeted at younger people who couldn’t afford more expensive models, and before quartz mass production led to cheap electronic models and the associated wide availability of replacement batteries, the 25xx series were seen as ‘disposable’ models that wouldn’t be serviced / repaired when they malfunctioned given their low price. Thank-you very much for your informative and interesting reply and for correcting my failure to appreciate the concurrence of production of the Homer and 2500 series movements. The 2520 now makes much more sense to me…economy of production and relative disposability. You’re welcome 🙂 Although a 25xx watch will never be valuable, it’s kind of nice to have a good working example of one, since they were not made to be kept for a long time so survivors are not that common. Hi, my mum left behind a watch. Just wanted to know whether is it more than 30yrs old (that’s what the shop told me). Cos it might be a gift from my father to my mum. It’s indicate as below (hope you can help me). Thanks for your great blog ! 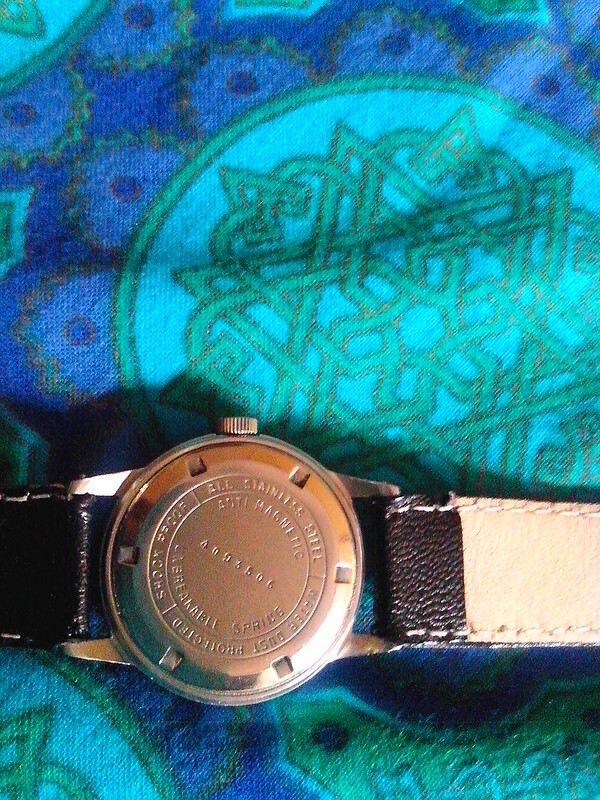 My daddy own a RythmDate watch, it’s a hand-winding which the dial (at six-o’clock) say “Parawater” and “Japang 188028-k”. 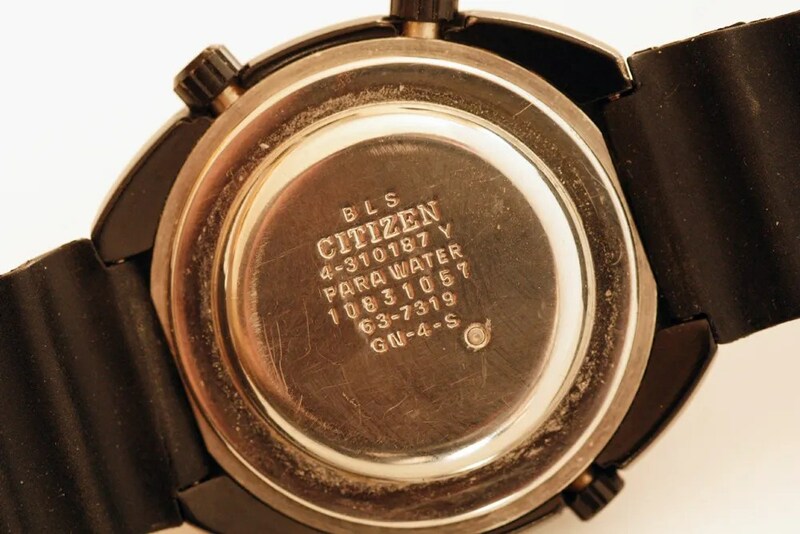 The back was C.C.P Citizen Parawater 4-180712KA. Would you please help me find how old the watch? © Stephen Netherwood and Sweephand's Vintage Citizen Watch Blog, 2016. Unauthorized use and/or duplication of images and material without permission is prohibited. I am happy to consider giving permission for use of images and other material, but I would like to be asked before it happens! 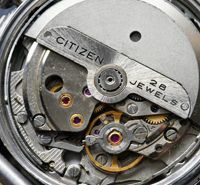 Want to know when your vintage Citizen watch was made? Cosmotron from 1971 – What’s So Unusual? Don’t Forget to do Your Research Before You Buy! Citizen Chronograph 67-9071 ‘Monaco’ – More than a restoration!